I have problems with our gossipy giraffes and the lion that listens to them. I work in a zoo. The staff is spread out over several buildings and has a wide variety of duties and skills. In the building I work in there are several departments, including administration and support staff. The work environment lends itself very well to gossip, and most of my coworkers engage in chatty conversation that, while gossip, does not appear to have a malicious intent. I do not believe it is possible to stop the chatter, since it’s a zoo around here and lots of very odd things happen. My issue is with leadership that listens to the gossip and then treats it as gospel. What do I do when one of my bosses (not my immediate boss, but my boss’s boss) accuses me of things I did not do without using any specifics and based as best I can tell on rampant office chatter? My impulse is to ask for specifics, but because I am being accused of being intelligent, arrogant, and socially unskilled I am not sure that it would help my cause. Please be aware that I have never before been accused of any of these things by prior employers or by other employees at this institution (OK, I have been told I am intelligent, but never had that presented as an accusation). I am not perfect of course, but my employees are happy, feel valued, and are very effective at their jobs. So I found it particularly surprising when I was told that one of my team members was looking for other opportunities to get away from me. I spoke the person in question, not touching on that specifically, but offering to provide a glowing reference if they were looking for other employment. (We don’t pay well, so it’d be easy enough to say they were job seeking without having an awkward confrontation if they were looking only to get away from me.) This individual was shocked at the very idea and is not apparently seeking other employment. 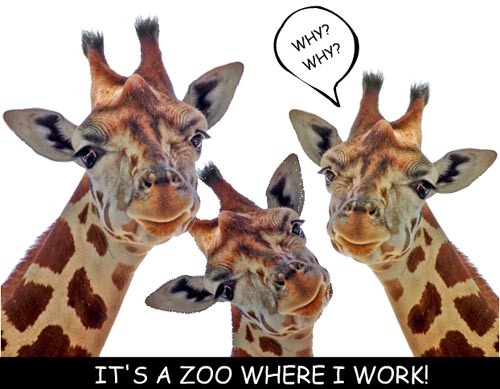 In fact, they said several times that they don’t work at the zoo for the money and enjoy working in my department. This is not the first time this individual has based a reprimand on gossip. The feel of being picked from the herd has cyclic quality to it, but I am not sure if I am simply a safe pressure release valve or if there’s a biological basis. Periodically there are whiffs of his treating me differently because I am the only person at this level of management who is an unmarried female, but it could also be because he believes I will ultimately leave the zoo. He is an asset to the zoo and on the whole a decent boss, my only issue with him is in the way he handles personnel issues. Is it possible that the boss in between us has set me up for a “wounding the king” scenario? This middle boss is not particularly sociallly skilled, but aside from suspicion that he may have engaged in a behind the scenes campaign against all of his subordinates I have not had any particular problems with him. Based on your letter, I’m going to make some basic assumptions that should help me better respond to your questions. 1. You have a strong level of self-awareness. Admitting you are not perfect and being comfortable with your intelligence (but not to the point of being arrogant) show me that you are not just creating a victim mentality. 2. You are able to analyze and diagnose before prescribing. It sounds like you handled the gossip about the reportedly dissatisfied employee rather well. 3. You like your job and want to see the situation improve. There are some things to think about when dealing with the type of individual who thrives on gossip to bring down other people. Generally, this individual tends to be insecure about himself. This is demonstrated by the fact that intelligence is now an accused crime. Another thing is that this individual will not be accountable for the information that he is using against another person; innuendo serves as judge and jury. If he is doing it to you, chances are high that it is happening to others as well (you just happen to be the weakest of the herd at the moment). Responding in this fashion puts him on the spot, but it still allows him to save face. What you are doing is sending the message that the rumor mill now is being tracked and documented. If you start getting in trouble for the email trail, simply suggest to him that in this society — where anyone can sue anyone else over hearsay — that you are protecting him and his interests, and that he may want to be more conscientious of the rumor mill before continuing it. It may not seem like it because of the power distance between him and you, but I would be willing to bet that he is much more afraid of and intimidated by you than you are of him. Again, this sends a message without putting the other person on the spot or possibly turning them against you. It also sends the message that you’re not a person through whom idle gossip can be channeled.